Is Your Microsoft EA Coming up for Renewal? Attend the most complete and up-to-date course on Microsoft licensing available. 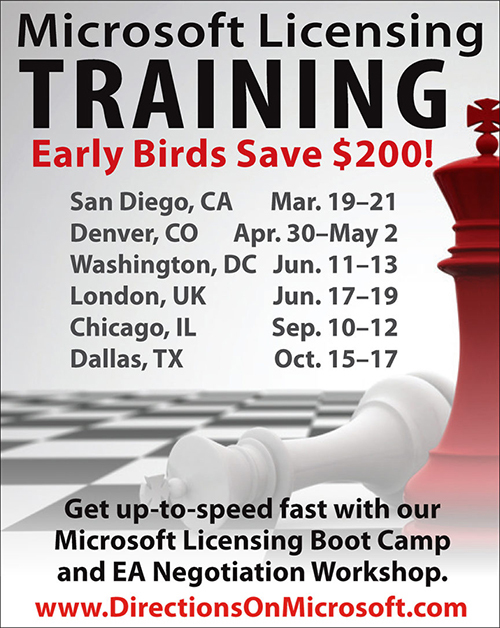 The next Directions on Microsoft (DOM) licensing training is in San Diego, CA on March 19-20, 2019. Our independent experts show you how Microsoft licensing really works and give you the knowledge and understanding you need to take control and extract maximum value from your next Microsoft agreement. Directions on Microsoft is an independent analyst firm in the Seattle, WA area that has focused exclusively on Microsoft technologies and licensing programs since 1992.